Hi everybody and welcome to OTTT #5 ! I didn't have the time to update my introduction, so I'll ask every new poster to read the intro of the OTTT #4 before posting something. Last edited by Isildilmë on Fri Jul 17, 2015 1:22 pm, edited 1 time in total. Sorry if this has already been requested, I couldn't find it. It is in English, and I would like it in Tengwar Annatar, and Tengwar Annatar bold please. In English, in Tengwar Cursive (R) and Tengwar Eldamar (R) please and thanks! Almatolmen wrote: V! Wow, that's remarkable! I'm impressed myself to be at that point ! What is a lot less remarkable is that I didn't fill my promess of last week end... I realised that I hadn't send my Xmas cards, and that I was absolutely not ready to receive my whole family on the 24th, and that I was obliged to put these in priority before completing the requests and posting them. I also didn't know that we would have so much snow and that I would need to quit for work that early in the morning, so it is impossible to work on that before I go. Shame on me, I'm really sorry. I have still much to do, but I hope to have these done before the new year. Again, sorry, I should have analyzed all of this before saying that I was ready ! I'm planning to have this tattooed on New Year's eve. Thanks a lot! Please transcribe the sentence "han mathon ne nen" for me in the tengwar 04. I would appreciate that much. Great work done all these years. I would be most grateful for the tengwar annatar cursive transcription of Alexander. I looked through the various threads and could not find this so apologies in advance if it has already been shared. Many thanks for your diligence in helping people out with this. Please transcribe the sentences "I amar prestar aen" and "han mathon ne nen" for me in the tengwar 04. I would appreciate that much. Just a note for Isildilmë, in case you don't know it: kigerms' sentences are in Sindarin. Gladhaniel wrote: Just a note for Isildilmë, in case you don't know it: kigerms' sentences are in Sindarin. It was my fault. Please delete the first one. I know that the sentences were spoken in Sindarin. And I love the meaning of it. Does Sindarin use tengwar as the letters? Please let me know thank you. Could you transcribe the Sindarin words Glass and Gell into the following: Tengwar Annatar (normal), Tengwar Sindarin (normal & italic), & Tengwar Cursive (normal). I asked my artist and he prefers Tengwar Annatar (I-B), please disregard my first request. I apologize. 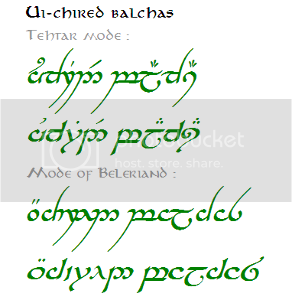 Could you please translate the following phrases in Tengwar Annatar, Italic and in Italic+Bold? I would be most greatful!! Last edited by Anne-Marie1984 on Sat Dec 29, 2012 3:06 am, edited 1 time in total. kigerms wrote: Does Sindarin use tengwar as the letters? Please let me know thank you. Of course, the Tengwar can be used (and have been widely used) to write Sindarin. Gladhaniel precised they were in Sindarin because this is important for the transcription : the Tengwar don't have the same values from a language to another. kigerms wrote: Please transcribe the sentences "I amar prestar aen" and "han mathon ne nen" for me in the tengwar 04. I would appreciate that much. 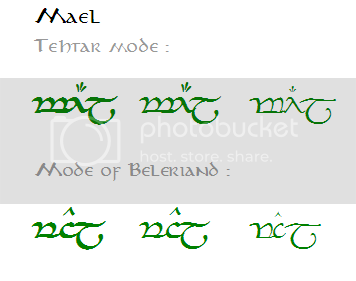 Are you sure you want it in Tengwar 04 ? This font is in the list of fonts I try not to use because it's a bit incomplete and not very user-friendly. If my memory is good, the way it was designed results in weird spaces and impossibility to have the symbols centered with the tengwar. If you really insist to have this font, I'll have a try, but I can't warranty the result will look nice. Did you read the intro of the OTTT-4 ? The link is in the first post of this thread, and you have the list of my fonts in that link. Tell me what you decide. I saw all the requests, and they will all be answered in time... but I can't warranty a date for those who already have their appointment... I have a life too, you know. I'm so very sorry for the delays, group ! But now that my Christmas party is done, I should have a bit more time... here you go with a few transcriptions, for example ! For Gatelina : Here is a transcriptions made with a mode adaptated to Bulgarian and corresponding to the Cyrillic version of the name. As for Gatelina, I used the cyrillic version of the name to transcribe it. What is funny is that as I told you before, I made this mode myself. There was only one or two letters I had to “invent” (adapt because there is no equivalent as far as I know in official modes like English), but I’m really happy and satisfied with the result. And then I remembered that I had the impression I saw another mode than the “not that good” one I had before. So I searched in my stuff, and I found it. It’s a page in Bulgarian, and I had a hard time decoding everything when I first used it long ago. So I did it again, and I realised that what they propose is exactly the same as what I proposed ! Except for that “invention” of mine, they invented something different, also logical, but different. I don’t know what I’ll choose between the two, but for now it’s not important as it is not a letter of your request . But it prooves how logical was my mode, and that is a pretty good new ! For salorvenus02 : Here you go ! I hope your pregnancy goes well ! For Harondor : As I told you, I didn’t use an official punctuation for the hyphen before the “source” closing the quote, but I opted for what corresponded the best for aesthetical purposes. 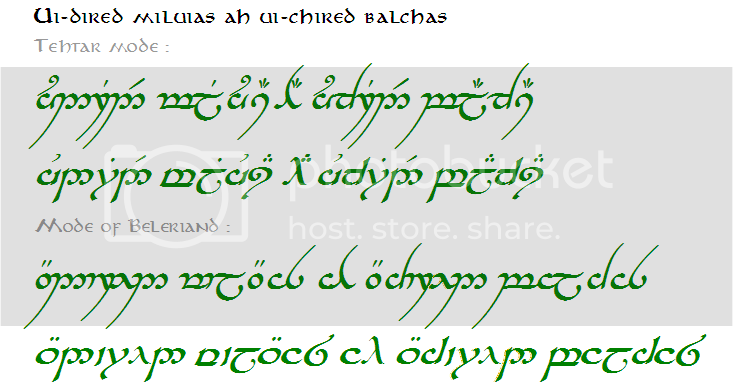 For Eatenflesh : Here are the two words, written according to the two usages with Sindarin, and in the three fonts you asked. And you have still time before the date you mentionned to think of your choice ! For AlyxPayne : I did all the languages, as I knew I would have the time for it. After all, you, Dhani and Xand took the time to make it translate, I can finish the work so it wasn’t translated for nothing. 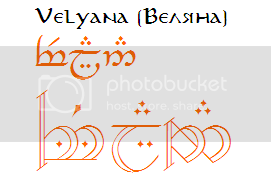 I realised that you asked for a different font for every languages… I wonder if it’s because you think that if something is in Sindarin, we should use TS, and the same for Quenya and TQ ? These are just font names. You can use anyone to write any language. So in case, I also used the TA-I+B that you asked for English for the other ones. I also did them with the fonts that you specifically asked. 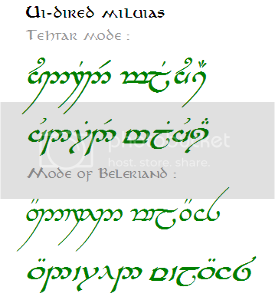 As you asked for the two sentences in one, I did the same for Sindarin and Quenya, adding the “and”. I hope to have others for you tomorrow ! Depends on the snow ! Okay, Tengwar Cursive [I] [B] is choosen. 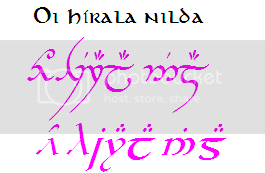 Hi there, if it wouldn't be to much trouble could i have this quote in Tengwar Annatar and Tengwar Cursive with Italic and Italic Bold? Thank you! How nice is this !! Do I deserve such wonderful compliments ? really ? Thank you for commenting, I feel how important this is for you. Don't forget to send me a picture ! You can email me to let me know how things are going. I would love to see how my name "Alexandra" would look like in Tengwar. I've been trying to figure it out myself, but i'd rather get it from a pro! Hullo I would love to have this text for my tattoo. Night of January the fourteenth , the year 2012. The fonts are Tengar Annatar Regular & Italic ,and Tengar Parmaite regular & Italic.